White Cane Safety Day celebrates the achievements of blind or visually impaired people. A white cane is an important mobility tool for such people as well as the symbol of their independence. Canes have been used by blind people for centuries, but the white cane was introduced in the early 20th century. Canes were painted white to be more easily visible. In 1931, Guilly d'Herbemont, who is considered to have invented the white cane, gave the first two canes to blind people. In the United States, white canes were introduced and promoted by Lion Clubs International. There are different types of the white cane such as long cane (also known as Hoover cane), guide cane, identification cane (symbol cane), support cane, and kiddie cane. Not all of them are used as a mobility device. For instance, the ID cane alerts others as to its bearer's visual impairment but is of no help as a mobility tool. 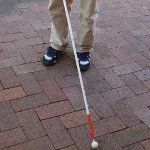 The white cane is one of the symbols of a blind person's independence at it ensures their ability to come and go on their own. In 2011, President Barak Obama also referred to White Cane Safety Day as Blind Americans Equality Day.